Ive had the pleasure of hearing." Sound "The MG3.6/R's ribbon tweeter is a joy to hear" for its "natural silkiness that is reminiscent of the real thing"; Andrew was also struck by "the lack of coloration heard from the MG3.6/Rs midrange driver," the "ability to faithfully render the scale of a large musical event," and the "downright authoritative" bass when the speakers were paired with the Simaudio W-5 amp. Features "Three-way, full-range dipole design based on Magnepans patented planar-magnetic driver (500 square inches in area for the bass, 199 square inches for the midrange) and 55" line-source ribbon tweeter"; "rear-mounted external crossover." Use Adapters are required for using speaker cables with spade terminations; require "a few hundred hours" of break-in time; those who think that Magneplanar speakers can't do bass should listen "with a capable amplifier (or two), preferably in the 200-400Wpc range into 4 ohms." Value "I know of not a single speaker at or near the MG3.6/Rs price that can reproduce music as faithfully." I have a soft spot for Magneplanar speakers. My first truly "high-end" system contained a pair of Magnepan SMGa speakers at its heart. Driven by a Naim NAP90 power amplifier, a NAC62 preamplifier, and using a Rega Planar 3 turntable as its source, this system sang like no other Id heard at home before and started me on my audiophile journey. The entry-level SMGa eventually gave way in my system to a dynamic loudspeaker that possessed better transparency and dynamics, but I never forgot the unique boxless sound of the Magneplanar driver, and I always hoped to one day have a room large enough to accommodate one of Magnepans more advanced designs. A new home purchase last year gave me the opportunity to finally move my audio system into a room large enough (approximately 400 square feet) to house a planar loudspeaker. About the same time, the buzz on the Internet about the Magnepan MG3.6/R as well as my own exposure to the speaker at both the 2000 CES and a local dealer's showroom piqued my interest. With the cooperation of Magnepan, a pair of MG3.6/Rs was on a truck to California for review. The MG3.6/Rs arrived in three boxes: two long, narrow boxes housing the panels and a third containing the outboard crossovers and mounting hardware. I had heard horror stories about Magnepans "terrible" packaging, but it seemed more than adequate: thick pieces of Styrofoam in all of the appropriate places, sturdy magnetic protection strips to keep the delicate ribbon tweeters in one piece, and a decent cardboard outer box. While its certainly true that a misplaced forklift blade would go through this packaging like a hot knife through butter, a wooden crate or other more elaborate packing materials would certainly add to the purchase price of the speaker. In my opinion, Magnepan made a reasonable tradeoff here. Unlike most of the other speakers you might be familiar with, the MG3.6/R requires some assembly. First, the painted metal feet that keep the speakers upright must be screwed to the panels. Second, the external crossover boxes must be inserted into the female connections at the base of each panel and secured using a series of small set screws. Finally, a metal brace is secured between the panel and the bottom of each crossover box in order to support the weight of the box and prevent it from pulling away from the panel. Once the speakers are standing upright, the sheer size of the MG3.6/Rs becomes apparent. At 71"H x 24"W, the MG3.6/Rs will visually dominate nearly any reasonably sized room, and certainly proved the focal point of my relatively large 20' x 21' listening space. The speakers weigh 70 pounds each, surprising given their mere 1 5/8" thickness. The MG3.6/R ($4200 USD per pair) is a three-way, full-range dipole design based on Magnepans patented planar-magnetic driver (500 square inches in area for the bass, 199 square inches for the midrange) and 55" line-source ribbon tweeter. The planar-magnetic driver is made from 0.0005"-thick Mylar film, while the ribbon tweeter is made from an aluminum strip barely 1/1000th of an inch thick. Crossover frequencies are 200Hz and 1700Hz. Magnepan quotes a 34Hz-40kHz frequency range and 86dB sensitivity for the speaker. Even with the delicate materials involved, Ive heard very few reports of driver failures, and I experienced none during the time period I put the MG3.6/R through its paces. Most reported failures seem to be related to the ribbon being overdriven or otherwise abused, so Magnepan has protected the tweeter with a user-replaceable fuse to lessen the likelihood of amplifier-induced damage. As with all Magnepan speakers, the MG3.6/R is an enclosureless design. Only a light MDF frame holds in place the diaphragms and bar magnets that make up the planar-magnetic system. The speaker is nicely finished with attractive oak trim (available in standard natural or black, or optional light or dark cherry) and a non-removable grille cloth (you can take your pick of cherry-white, black or gray fabric). While the industrial design of the MG3.6/R isnt quite in the same league as that of, say, a Martin Logan ESL or the Ambience ribbon hybrid I reviewed last year, the speaker has reasonable visual appeal and good fit'n'finish. The MG3.6/Rs rear-mounted external crossover allows for single or biwiring as well as single or biamplification via a set of user-configurable jumpers. I only had a single amplifier on hand capable of adequately driving the relatively power-hungry MG3.6/R, so I didnt have an opportunity to go the biamp route. I have two usability gripes with the design of the crossover box. First, affixing the box to the panel via the supplied set screws is tedious -- theres just too little space between the set screws and the panel to be able to get more than a quarter turn from the allen key used to tighten the screws. Second, the speaker terminals on the rear of the crossover only support cables terminated with bananas. I had to borrow a set of spade-to-banana adapters in order to use my preferred speaker cables with the MG3.6/Rs. Magnepan does sell sets of nickel- and gold-plated adapters ($17 and $22 per pair respectively), but they are not included with the speakers. As with most dipole loudspeakers, placement of the MG3.6/Rs had significant impact on performance: too close to the front wall and soundstage depth suffered, too far apart and the phantom center channel all but fell silent, too little toe-in and image precision was lacking. After considerable experimentation, I wound up with the speakers approximately seven feet apart, four feet from the front wall and nine feet from the listening position. Toe-in was about 10 degrees, and the tweeters of the mirror-imaged MG3.6/Rs were on the outside. I left the front wall untreated (a modeled plaster finish common in Northern California homes gave the walls some texture), but side-wall reflections were damped with thickly lined drapes. In this configuration, the speaker had a relatively smooth tonal balance (as measured by a Radio Shack SPL meter, recalibrated for even response and validated by my own ears), excellent soundstage width and depth, and good imaging. Magneplanar speakers are known for their long break-in time, and the MG3.6/R was no exception. Out of the box, the speaker would best be described as diffuse-sounding, with little bass and a distinct lack of integration between the planar-magnetic panel and the ribbon tweeter. But all of this changes for the better after a few hundred hours (yes, it takes that long), at which point the panel and ribbon integrate nearly seamlessly, the panel begins to plumb the deepest depths of the orchestra, and the speaker begins to sing like few others. Like a fine wine, the Magnepan MG3.6/R only gets better with age. To put what follows into context, I auditioned the MG3.6/Rs in the my usual reference system, which consists of an all-analog front-end (VPI Aries turntable, Graham 2.0 tonearm, Transfiguration Spirit moving-coil cartridge), an Audible Illusion Modulus 3A preamplifier with John Curl-designed Gold moving-coil phono boards, and a Simaudio Moon W-5 power amplifier. 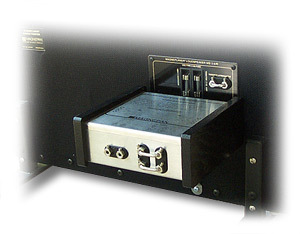 All cabling is by Harmonic Technology (Pro-Silway Mk.II interconnects, Pro-9 Plus single-wire speaker cables, and Pro-AC11 power cords), and all components were placed on a Finite-Element Pagode Reference rack. The MG3.6/R's ribbon tweeter is a joy to hear. That a simple piece of aluminum thinner than a human hair can be made to reproduce musics high frequencies with such beauty is a tribute to the engineering prowess of Magnepan chief Jim Winey. Just listen to a well-recorded violin on the MG3.6/R and youll see -- er, hear-- what I mean. Gone are the subtle ringing and harshness of even the best dome tweeters, replaced instead by a natural silkiness that is reminiscent of the real thing. The MG3.6/R ribbon is also capable of revealing fine inner detail buried by the faint distortions of lesser drivers, removing a layer of the proverbial scrim between the listener and his music. I listened to literally dozens of jazz, pop and orchestral LPs while looking for a chink in the ribbons armor, but I found none. This is certainly one of the finest high-frequency transducers currently available. Once I had put the Magnepan MG3.6/R speakers into my system, I was struck by the fact that much of what I had heard about the speakers seemed greatly in error. Baseless reports of bass-less Maggies, for starters. It just aint so! With the right amplification and careful setup, the MG3.6/R can offer surprisingly satisfying bass. And due to the fact that the ribbon tweeter is very narrow and hence has outstanding dispersion in the horizontal plane, the MG3.6/Rs have a much larger sweet spot than you may think. I suspect that reports to the contrary are products of assumption rather than observation. However, reports pertaining to the MG3.6/R's uncanny top-to-bottom coherence are not exaggerated, nor are reports of one of the most extended, airy and refined tweeters around. But these qualities are only the beginning of what makes the Magnepan MG3.6/R such a success. Ive owned a plethora of speakers ranging from dynamic boxes to electrostatics to ribbon/dynamic hybrids, and theres one thing that Magneplanars do like no other speaker. Where some speakers seem to be at odds with the room, Magneplanars work in concert with their environment and seem to invite it as a willing partner. I suspect that this is why, although Ive heard Magneplanars in several showrooms, Ive only come to appreciate them fully since Ive had them in my listening space. Here they make the room absolutely come alive with what may best be described as total aural saturation. This immersion draws me into the performance, making for a more engaging experience. Where some speakers perform almost in isolation, the Magneplanars do a better job than most of drawing the listener in for a more profound connection with the performance. This is what I enjoy most about them. One last thing separates the MG3.6/R from other exotic speakers: Once their appetite for watts is sated, these speakers are incredibly easy to live with. Ive mentioned the sweet spot, which is unusually wide for a speaker of this ilk. But unlike electrostatics, which become absolutely unlistenable as you move off-axis, the MG3.6/Rs remain completely enjoyable. Also credit their stature and the full-length ribbon tweeter for the fact that they are amazingly uncritical of listening height. I frequently enjoy listening to the MG3.6/Rs while sitting on the floor playing with the kids. Try that with any other speaker. The Magnepan MG3.6/Rs are wonderful speakers and even at their $4200 price a tremendous value. I dont want to spill too many pixels focusing on this or that portion of the musical spectrum, but the MG3.6/Rs bass reproduction is worth singling out, if for no other reason than the speakers lack of low bass has been so greatly exaggerated. The MG3.6/Rs reputation for having little low-end extension has, I believe, more to do with a poor choice of partnering amplifier than it does with any shortcoming of the speaker itself. When driven by the Simaudio Moon W-5, an amplifier that, in my experience, has yet to meet a speaker it couldnt drive admirably, the MG3.6/R sounded downright authoritative in the bass. While listening to Zubin Mehtas reading of Holsts The Planets [London CS 6734, LP], replete with powerful bass-drum whacks and rumbling double-bass lines, my wife, who is an audiophile out of necessity rather than choice, shouted, "So much for the Maggies not having any bass!" No argument here. The ample low-frequency information cut into the Classic Records reissue of Holly Coles Temptation [Blue Note/Classic Records JP5003 LP] also fell well within the grasp of the MG3.6/R, which managed to sort out all of the subterranean information buried in this dense musical mix. After my three months of listening, the myth of the missing Maggie bass has been put to rest in my mind. Detractors would do well to listen to the MG3.6/R with a capable amplifier (or two), preferably in the 200-400Wpc range into 4 ohms, and I have no doubt theyll hear what theyve been missing. While Ive heard some of the better dynamic speakers reproduce the human voice in fairly convincing fashion, none compared to the MG3.6/R and its planar-magnetic driver. The distortions inherent to cones in boxes, which allow the mind to easily perceive the difference between a real voice and its electronically reproduced counterpart, were largely diminished by the MG3.6/Rs lack of an enclosure and the use of a low-mass midrange panel driven uniformly across its surface. While not a great recording by modern standards, Ella Fitzgeralds Ella Swings Lightly [Verve MG VS-6019 LP] swung wonderfully on the MG3.6/Rs. Ellas superb phrasing and intonation on "Little White Lies" and "You Hit the Spot" were beautifully rendered by the MG3.6/Rs, and the somewhat somber lyrics of "As Long As I Live" took on newfound emotion. Listening to a wide array of female vocal records, from artists as diverse as Tori Amos, Jewel, Nancy Bryan, and Cassandra Wilson, I was continually struck by the lack of coloration heard from the MG3.6/Rs midrange driver and the way in which that lack of coloration translated into a deeper level of musical involvement. Something that has always drawn me to large panel speakers is their ability to render faithfully the scale of a large musical event, such as the performance of a work for full orchestra. In this regard, the MG3.6/R did not disappoint. But just as importantly, I was impressed by the fact that the MG3.6/R did not inflate small-scale chamber works or jazz trios to unnaturally gargantuan proportions, which would have ruined the illusion of real musicians playing in a real space. Listening to Shostakovichs String Quartet No.8 [LOiseau-Lyre DSLO 11], I was struck by how realistically the MG3.6/R rendered the size of the soundfield and the instruments within it, lending the performance an almost physical presence. Given the size of the panels involved, the MG3.6/R imaged pretty well. For those looking for narrow-baffle-like precision, however, they wont find it here. Image outlines as presented by the MG3.6/R were decidedly on the round and fuzzy side, but the level of musical satisfaction I enjoyed via the MG3.6/R sans pinpoint imaging made me question my previous fixation on this parameter of audio reproduction. In terms of dynamics, particularly microdynamics, the MG3.6/Rs were second to none in my experience. The minutest change in pressure placed on the keys of a piano, the slightest variation in the vigor with which a violins strings are plucked, and the subtlest change in the force of bow against string were all resolved easily by the highly revealing MG3.6/R. I hate to use a well-worn audio cliché, but the MG3.6/R did bring to light important musical information that had gone previously unnoticed on repeated listening. Large-scale dynamic swings, aided certainly by the Simaudio amp, were also handled with aplomb by the MG3.6/R. I made the mistake of listening to Edgar Vareses Arcana [Decca/Speakers Corner SXL 6550] in the dark one night, and I was literally scared out of my seat by the dynamic realism of this grotesquely beautiful work. The speaker Ive auditioned at length that's closest in terms of price and design to the MG3.6/R is the $4500-per-pair Super Slim 1800 from Ambience of Australia. The Super Slim also employs a line-source ribbon tweeter for the high frequencies, but mates that to a dynamic driver for the bass and midrange. While I enjoyed the Super Slim and found it to be a good all-around musical performer with excellent integration of the ribbon and dynamic driver, the MG3.6/R was more coherent and offered superior top-end extension (the Ambience speaker sounded rolled off on top). The Super Slim also suffered from a measurable, and audible, suckout in the bass that I could never ameliorate. The MG3.6/R, on the other hand, had a relatively flat in-room frequency response and better overall low-end performance. 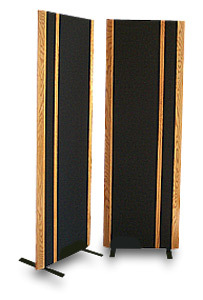 Other worthy competitors are the hybrid ESLs from both Innersound and MartinLogan. I havent listened to the top-line Innersound Eros at length, but I did enjoy the budget Isis and thought it quite a good buy. Although considerably more expensive, the MG3.6/R is, expectedly, a couple of notches above the Isis in terms of refinement and musical accuracy. Unlike the Isis and the Eros, the MG3.6/R will throw a soundstage wide enough for more than a single listener to enjoy its charms. The MartinLogan ESL/dynamic hybrids certainly have it all over the Magneplanars in terms of industrial design. And while the MartinLogan hybrids I've heard over the years have come a long way in terms of ESL/woofer integration, the MG3.6/R is better integrated still, sounding more of a single sonic cloth. I know of not a single speaker at or near the MG3.6/Rs price that can reproduce music as faithfully. Some speakers may play louder, some deeper, but none can bring the sound of real musicians playing in a real space into the listening room with conviction equal to that of the Magnepan MG3.6/R. If youve got the space and money, and you dont give a hoot what your decorator thinks, then run out to your local Magnepan dealer and give the MG3.6/R a listen. Simply put, the MG3.6/R is one of the finest loudspeakers Ive had the pleasure of hearing. Price: $4200 USD per pair.